Home Beers Sierra Nevada Brewing Co.
Narwhal Imperial Stout | Sierra Nevada Brewing Co.
A malt-forward monster, highlighting the depths of malt flavor. Narwhal Imperial Stout is inspired by the mysterious creature that thrives in the deepest fathoms of the frigid Arctic Ocean. Featuring incredible depth of malt flavor, rich with notes of espresso, baker’s cocoa, roasted grain and a light hint of smoke, Narwhal is a massive malt-forward monster. Aggressive but refined with a velvety smooth body and decadent finish, Narwhal will age in the bottle for years to come. Appearance - Pitch black and not a ray of light makes it through the abyss. One finger dark beige head sticks around as a wispy cap and leaves nice lazing. Taste - Dark roasted malts kick it off with ample vinous fruitiness and charred grain, an estery, spicy alcoholic note complements the malts and warms the throat, bittersweet cocoa, anise/licorice notes, and a bit of grassy/earthy hops round it all out. Starts fairly sweet but finishes fairly dry with a restrained bitterness and last flavor that coats the mouth. Flavor really pops as it warms and opens up. Feel - This is pretty much a monster beer: full bodied and creamy smooth, yet doesn't feel too heavy (like you're drinking an entire meal), and I like that. Carbonation is gentle yet prevalent, carrying the big body along nicely. Overall - Awesome stout. It has some very interesting fruity and notes that you don't see in a lot of other imperial stouts, and is really dangerously drinkable. It just doesn't feel all that heavy and "chewy", like drinking your dinner, which, while some may disapprove of, I enjoy. Pours an inky black color, thick as can be - honestly, one of the thickest looking beers I've ever seen. Tan head, decent retention. Aroma hits with a handful of roasted malts, as expected; the bottom comes up with some bittersweet chocolates and deep, warming alcohol notes in the background. A light leathery and mild tobacco aroma as it warms, too. The taste comes through with a canvas of roasted malts upon which a painting of mild charring, smoke, deep cocoa, light black licorice, faint dark fruit sweetness, and bitterness almost resembling espresso is displayed. The sweetness comes in hardest in the form of licorice, but is met diligently with a bitterness that is present from nearly start to finish; slightly ashy and mildly floral and spicy - I'm assuming this bitterness is from the hop character, although some of it tastes like that old bitter espresso bean flavor, too. Burnt, smoked wood in the aftertaste with some ashy and leafy bitter notes. Slightly sweet, but bitterness rules the aftertaste when all is said and done. Silky as hell, super creamy and thick. I was shocked at how delicious this was, but at the same time, I should have expected it. Sierra Nevada puts out a damn good product, no matter what it is, and Narwhal is no exception. For this price, this is a steal. Great flavors, huge body, amazing mouthfeel - if you like RISs, give this one a shot. Opened a 2013 this evening. RIS perfection in the non-barreled category. deep, rich chocolate malts. Smoky hints, velvet mouth feel. Black as my leather pants. Last week, after horseshoes, The Czar said to me: "[email protected] all that happy horse crap, hops, flavors, chiles, etc.... Get me a Narwhal"
It was a beautiful moment with the Czar. I'm all tingly thinking about it. mad that i only found one of these around, would have loved to have one to sit on for a while. dumped out a thick dark brown oil with a fizzy, bubbly tan head that slipped to nothing at all quickly. nose is burning with booze, with roasted malts and bitter chocolate, earthiness that comes in more as it warms. expected it to drink pretty hot, but this is smooth and tasty. earthy, roasted and bitter with a lot of dark chocolate, toast and a light coating of sweetness. full bodied and warming. quite comfy to drink. This beer is outstanding. Period. Unlike most people, I've had the barrel aged version of this prior to trying the regular version which I've cellared for a good while. Well, I'm happy to find that this regular RIS is exceptional if not quite as tasty as the barrel aged version. It certainly looks great: opaque black with a durable light brown head and lovely lacing. The high ABV is evident in the nose but otherwise fairly well hidden. Plenty of dark roasted grain flavor with minimal char and very light smoke -- just right IMO. Excellent bitter-sweet balance and mix. Some licorice. Pleasing and lasting aftertaste. Feel: Full but not thick body. Near medium, soft carbonation. O: Excellent and delicious. I haven't tried a fresh sample yet but I'd bet waiting until this is about 2 years old is a wise move. (High rating confirmed in June 2015 with a now older bottle0. Pours a perfect pitch black, like the darkest depths of the arctic sea, with a muddy cocoa ice floe of a head about a finger and a half thick that persists deep into the arctic summer. Rich chocolate and raisin smell. Other deep dark brew notes like prune, coffee, tobacco and the abyss. Taste is bitter sweet, dark chocolate, some coffee roastiness, sweetness that hints at plum and black cherry and blueberry. Incredibly coherent flavor, many complex beers parade tastes across your tongue, this one arrives wholly formed and settles in like an arctic winter. Mouthfeel is quite pleasant, not as pillowy as some big stouts I've tried and a tad bit toward the syrupy, but overall this is one fine expedition of an ale. Overall this is one of my favorite big stouts, hard to beat it in terms of value, accessibility, and downright, no nonsense, beery deliciousness. Can't wait to see how this monster ages. Visually I find this beer very engaging. To me, the Narwhal Imperial Stout aesthetic is incredibly personal, pleasing, and successful, with its exciting cetacean depiction and stylish black and white font and design. The charcoal-black pallor of this beer, when poured, proudly champions its own incomprehensibly deep, immutable, inner nature of modified sugars and transported starches, borrowed flavors and inherited tannins, all warped in a working world of yeast, a classic look for the strongest stout-porters of yore. A 12 oz bottle, capped in Nov. 15, yields an oceanic inch of sluffy, even brown foam as it's swiftly poured into a weathered 16 oz Fremont can-glass. The aroma is incredible, and will be described out of order shortly. Moving to taste, there is a harmonious fruitiness in this imperial stout; something many in the imperial category contend for yet very few achieve. Yet in addition to this dark, syrupy, imperious figginess comes an extremely defined and refined hop topography; a loud statement of aromatic, piney bitterness, potentially a result of the bold addition of Challenger hops, reportedly added late in the boil. The flavor here is really far out there, and especially the smell. But it truly comes as no surprise nor small victory that Sierra Nevada can offer such a triumphant brew. I'd like to add as an aside that flavor wise, what comes to mind as a rival could very well be Old Rasputin from North Coast. I'd love to see these two compared neck and neck. These are some top beers here folks. But, anyway, to get back on track, the secret method to the Narwhal's supreme taste here, in my opinion, is its enlightened, sleepy windows into flavors of coffee and chocolate, which themselves play back into and throughout the beer remarkably and extensively, finishing with whispers of smoke. Super masterful flavors, definitely buoyed by the look and smell. If someone were to mistake this for a Russian, I would pardon them. The feel here is good. It's not absolutely amazing, It's pretty good, solid. More descriptively, the feel itself is kind of sour, in a way, and has more of a tartness than oatmeal. With that said, wow, it's sturdy from tip to tummy, it's feel only improves with time elapsed from the sip. In other words, it has an exceptional aftertaste. This is a successfully fruity Imperial Stout.With it's high abv and sweetness, one could fairly get away with calling it Russian. This beer is not hard to drink. Good people make this beer. Try it with an open heart, and see if it's for you. I am very impressed. Overall: Pour this one stiff, folks, and enjoy. L. Thick-ish black pour, big ol' tan head of foam which recedes super slowly to bubbly patches. S. Bready, malty, toasty, baker's chocolate, hint of coffee, earthy or grassy. Chocolate and toffee as it warms. Smells pretty stout-y. T. Dark bread, cocoa, dark chocolate, grassy bitterness, coffee, deep dark roasted malty goodness, some toffee as it warms, more chocolaty toward the back end. Yes. F. Full feel, smooth, warming in the way back end, sticky chalky finish. O. You know when you're at the store and you're like "should I get this or should I get that?" Well this time it really worked out in my favor. Excellent beer. Recommended. Cheers ! ! ! Pours a deep dark brown, almost black. No light penetrated through this dark concoction. 1/2 finger head that dissipated fairly quick. Velvety smooth appearance. Its aroma was of bready yeast, dark roast grains, alcoholic esters, bitter dark chocolate. Faint banana smell was also present. The taste was of robust roasted grains and dark bitter 80% cacao. Very faint taste of hops was noticeable before everything was washed away by the alcoholic burn that permeated the mouth. Smooth mouth feel. Not as heavy as one might imagine for an imperial stout. As it reached room temperature it began to develop the flavor profile of a strong dark Belgian ale. Even the aftertaste was more akin to a SDB as oppose to a stout. Overall, I would recommend this beer to others. It's definitely a sipper. I missed that characteristic smokey aftertaste common to stouts as well as the creamy, chewy mouth feel, but all in all, this is a superb beer worth trying. - 2014. pkgd. 11.06.14. consumed 04.01.15. A: Pitch jet black exit from the bottle with a tan rawhide colored, creamy topping. Moderate retention. S: Nose of scotchy licorice, burnt chocolate, earthy bitterness, moderate awareness. No alcohol with a touch of dry vanilla bean. T: Flavor was deep roasted chocolate malt with an earthy bitterness. Dry vanilla bean, roasty espresso notes, flashes of burnt toffee sweetness with licorice. Smooth scotchy alcohol, hints of banana bread yeastiness underneath, creamer with smoky pine hops. M: Full bodied, creamy, earthy bitterness, burnt warmth, dry alcohol fade. O: Drinks like a B.A. stout, burnt roasted flavor, soothing scotchy pine alcohol. Nice flavor. Picked this up a few weeks back at Joe Canal's in Parsippany having never had this before. I love Sierra Nevada's offerings and was hoping that this would measure up to them. Thankfully, this did not taste like a dark version of their more notable Pale Ales and IPA's and considering the strength that this had, this was surprisingly easy to enjoy while being full and potent like a Russian Stout should be! The pour to this was a dark raisin with just a hint of light seeping in around the edges, with a moderate tan head that was punctuated with bubbles coming up from the liquid. It gave this a lively appearance and the head settled into a few rings of lacing that went around the top third or so of my pint glass. The baker's chocolate was in the nose big time, along with some currant, dark fruit, and booze and all of these were present in the taste as well. Quite sweet, this had a cloying taste to it and the coffee same out more in the aftertaste once the Belgian-like notes and chocolate went down. Not a lot of hops here, the bubbles could be felt but not seen as the mouthfeel was pretty smooth with just a hint of lactose that softly came through as this warmed up. This was strong but didn't really feel it but I noticed the warming coming over me once I made my way through this beer. Not overly spicy or boozy, this was a welcome departure from Sierra Nevada's other offerings while keeping up their level of quality that they've come to be known for. Those looking for a thinner Coffee Stout with hints of vanilla or a Russian Imperial Stout along the lines of the Old Rasputin will find that this straddled the line between the two, but quite nicely as I am looking forward to giving this another go! Certainly worthy of the Sierra Nevada moniker. still big huge roasted malts after 3 years in the cellar. the alcohol has definately cooled down drastically. hardly noticeable. not as choclatly as a fresh narwhal, but roastier and even more effervescent. some earthy flavors come through as well. body seems a bit light though. Feel: smooth finish, light carbonation. Molasses and chocolate. Alcohol seems a little more forward in this than in the BA Narwhal. Sweet and mildly bitter. Good to drink anytime but great in the winter. Tons of bitter chocolate with some oak and leathery characteristics pretty evely distributed as well. Pours about like a boozy beer does (not all of them, though, hence my lowered score) with a bittersweet nose. The port-black liquid isn't super thick but tastes about like the aroma, but with a creamy sweetness in the finish and a pretty drinkable presence on the ol' palate. Big, but not needlessly so. So I have been seeking this out for a while, did try the SN Porter and the SN coffee stout. Never had the regular stout, never see it around although I'm sure it is similar to coffee stout. saw this last night and got very excited . Much anticipation. Tried to not get my hopes too high as stouts always have that "filling" Maltiness to me and I drink iPas mostly. Wow. This beer is incredible. Very smooth. DEFINATLY not able to detect the 10.2% abv until it leaves your mouth with a chocolatey Bite. Not nearly as carbonated and "airy" as the Porter and stout. Perfection. Like a silky chocolate smoothness. Not sure if I could have more than one because of the sweetness. But, still, after the first sip I was already wondering how I'm gonna secure another 4 pack. I based these on 2015 version while having a 3yr vertical of 13, 14, & 15. It warms up to be rather smooth and a classic RIS. Happy to see a non-bba RIS for once. Based on the 13, could benefit from aging but still tasty this early. Definitely let it warm up of course. I think you either love or hate this beer. Personally, I think it is good and the bottle art is great. If you like Sierra Nevada and stouts, dive in. Poured from the 12 oz bottle into a snifter. Pours squid ink black with a small smidgen of deep dark caramel head. Smells a bit light, but certainly elements of roasted malt and coffee. Taste is glorious. Deep roast, deep coffee bitterness. A nice mouthfeel not too thin which I appreciated since there was no barrel aging. Overall, this beer is delicious. Now on to BA Narwhal!!! Look: Deep, black, beautiful. Awesome bottle art, too. Smell: Smells a little like bittersweet coffee. Primary scents are malt and chocolate. Taste: Holy crap! It's like drinking a liquid chocolate cake! Seriously, so much chocolate! If you did a blind taste test, I would have a thought that this was a stout brewed with chocolate. A great beer for a chocolate lover like me! Other flavors I'm picking up are malt, coffee, with a little-to-medium hops present. Feel: Really thick and delicious. Very dense; definitely a sipper. Overall: Probably my all-time favorite Imperial Stout, and I'd go far to say favorite beer of all time. It's great taste and mouthfeel are definitely its best attributes, while it's 10.2 % ABV is also a plus. Easily one of the best beers I've ever had. 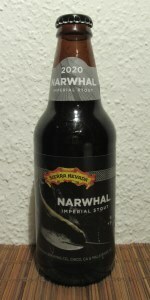 Narwhal Imperial Stout from Sierra Nevada Brewing Co.